Not sure it's enough to straighten the wheels! It stinks the bad mix between 3D and unsuitable Java code! This pack has never been planned for the HSFX 7.x.x without making the necessary adaptations! I have an HSFX 7.0.3 Install and have never had a problem with these aircraft. I'm betting the problem lies with the landing gear damage mod. Remove the landing gear damage mod and check if it solves the problem. 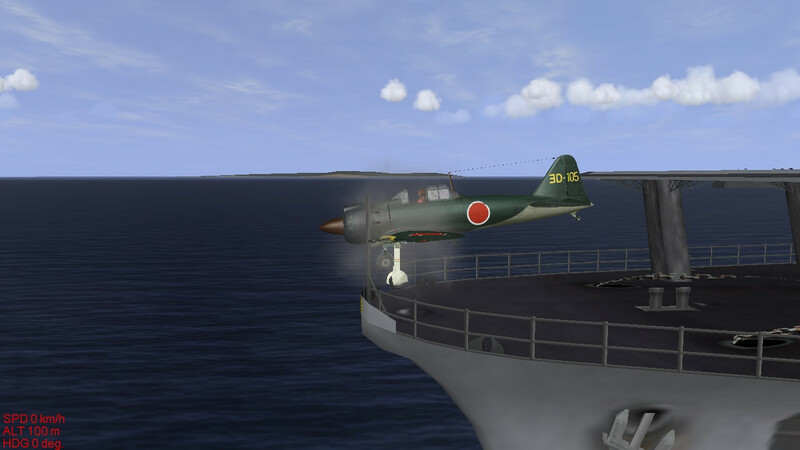 The tailhook of A6M8-54 doesn't seem to work, as it would fail to stop & fall right off the deck of default carriers when attempting to land. but I have looked at the aircraft files and it seems some details you are questioning about are coming from the "alpha-channel" on the DEFAULT Skins. They are in the "summer" folder and the main skin1o.tgb (size 1024x1024) , paint it out if you wish and leave the rest as it is. Save the file with the same name and size... then do 3 more saves for the other size skins 512x512.... 128x128 ... 32x32. Test the aircraft in your game to see if these changes are noticeable. If all is good to your desired effect and details, do the same thing with any other aircraft version which has this detail. If you are unable to do this ... post the names of the aircraft versions which need these changes made. There are 50 folders for many aircraft versions. I will make the needed changes ASAP . the aircraft do have radio masts for the antenna. Perhaps what you mention is a field-mod of some type? know where exactly these changes are made on the aircraft skin? It is a very dificult decision to make, let me explain why. but the hundreds of skins already available and being used by everyone, sometimes do not match these changes. The skins themselves will have to be re-painted around the window areas to have them "fit into" the default window changes done. my personal game some of the skins already available from other artists - BUT this is for my personal game. the colors and details wround their windows from their skins to fit better into the changes I have made in my default skin (window aread). already created and posted throughout the world and being used by everyone. This changing in the default skins to fit your version of the skin-art you are creating, would be more for a personal use game-mod. Not many people will be willing to change their game aircraft just to fit your personal skins. I can make these changes to your default aircraft skins (All of them if you wish) and send them out to you for personal use (via pm). But keep in mind that you will also have to create 50 NEW skins (historically correct) to also fit into all of the 50 aircraft models. of the usual Red circle version (Japanese Hinomaru insignia). But I left them as they were. Anyway, send me the new skins so I can see what exactly are the new changes. Perhaps your new skins can be adapted to this mod-aircraft default skins.